Experience our own rendition of a "cherry cordial"! We've added generous chunks of real Maraschino cherries to our original candy recipe, then drenched them in a rich semi-sweet dark chocolate to create a new holiday classic! Kosher. INGREDIENTS: corn syrup, sugar, chocolate liquor, maraschino cherry pieces (cherries, water, corn syrup, sugar, citric acid, sodium benzoate, potassium sorbate, artificial and natural flavors, red 40) cocoa butter, milk, modified corn starch, pectin (pectin, disodium diphosphate, sodium polyphosphate, dextrose, dicalcium phosphate), butter oil, artificial flavor, soy lecithin, sodium citrate. Though these are good, they do not compare to the Queen Anne cherry's like I had hoped they would. 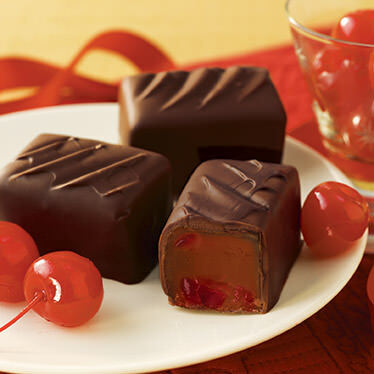 These are delightfully delicious - creamy dark chocolate, and a lively cherry jelly center! 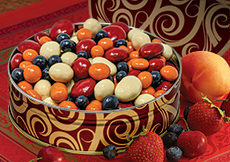 These were a free gift and I figured they were just another box of chocolate covered cherries but was so mistaken. 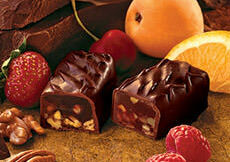 They are amazing, I love the good cherry taste, rich chocolate, consistency, the whole package! I am now ordering more--thanks for the freebie, I fell in love with it! oh we are addicted to these!! We should have ordered more! I wish these came in sugar free. I could have eaten the whole box myself. So soft and good cherry flavor with the dark chocolate so good with my red wine! You will love these!! I got these for my husband to try and ended up eating as many as he did! They are wonderful! OMG!! These are so good! So soft and chocolaty. I couldn't agree more with Lorraine from New Jersey. 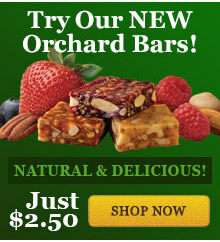 These were by far the worst tasting thing I've ordered fromyour catalog. Like a 3 in 1 oil taste got spilled into the batch. Not pleasant or very edible at all. Even my wife agreed something's "just not right". Certainly not what we were expecting, since normally your flavors are really "spot" on. Glad we didn't serve these to our guests! Good idea though, please try and improve. I can honestly say that this is the first product that I have purchased from you that I truly dislike. There is something about the taste that makes it overwhelming and disagreeable. Possibly too much almond flavoring. I feel that the cherry taste should be more subtle. I'm sorry I don't like them. 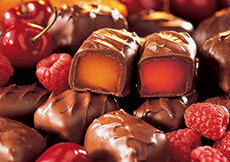 My original taste caused me to cancel my gifts of this and replace with the other chocolates. Since then, I find that people want this item very badly. Thus, I am ordering more for friends and family.